In a complete 180 from Sunday’s Did You Ever Have a Family review, I’ve decided to dedicate this week to reviewing a highly underrated category of books—young adult fiction! I know too many people who turn their noses at the notion of reading a book intended for a younger crowd [in fact, when I was in Middle School, I was one of them—always preferring to seem ‘mature’ and ‘old’ by selecting books meant for adults], but these books are quick, nostalgic reads, often chock-full of wisdom from a childlike perspective—a healthy state for all of us to return to every once in a while. 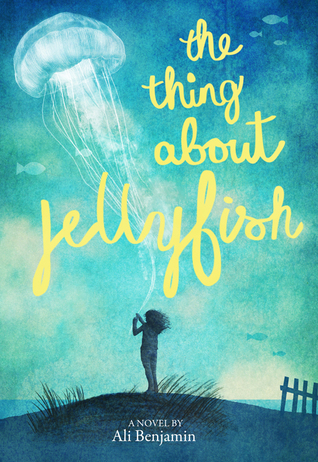 The book I’m reviewing today, The Thing About Jellyfish, by Ali Benjamin, was recommended to me by my close personal friend, Reese Witherspoon (as in, she shared an Instagram of the book announcing that she loved it so much, her production company was going to make it into a movie). At the outset of the novel, Suzy, our protagonist, discovers that her former best friend, Franny, has drowned. Given Franny’s aptitude as a swimmer, Suzy refuses to accept this explanation; and instead makes it her mission to prove that her friend was actually the victim of a fatal jellyfish. The plot sounds silly, and it is a children’s book [no, like, it wasn’t even in the young adult section—I had to walk back to the ‘play area’ and endure the stares of a number of confused moms as I made a beeline for the book], but it becomes clear over the course of the book that even Suzy herself knows her attempts to prove her outlandish theory are actually tied to something else entirely. It’s an excellent exploration of the middle-school mind, and the major maturity gaps during that time that cause friendships to falter and fracture. There are moments where you’ll cringe and roll your eyes at some of Suzy’s juvenile behavior, but minutes later, you’ll find yourself feeling for her as she shakily navigates the brutal social hierarchy of her middle school. The book touches on topics oft explored in adult contemporary fiction, such as relationship, sexuality, broken families, and mental health—but Benjamin is able to represent these serious [and often overwrought] in the refreshingly blunt manner that only a child can manage. Whether or not you had a traumatic middle school experience [I, for one, didn’t], you’ll be rooting for Suzy the whole way through.